Video footage has captured the moment an 85-year-old woman was crushed to death by an armored military vehicle on a road closed to traffic in the southeastern province of Diyarbakır in June 2017. The elderly woman, Pakize Hazar, was killed by the military vehicle on June 14, 2017 in Diyarbakır’s Lice district. She was on her way to withdraw her monthly pension, according to the Mesopotamia news agency. 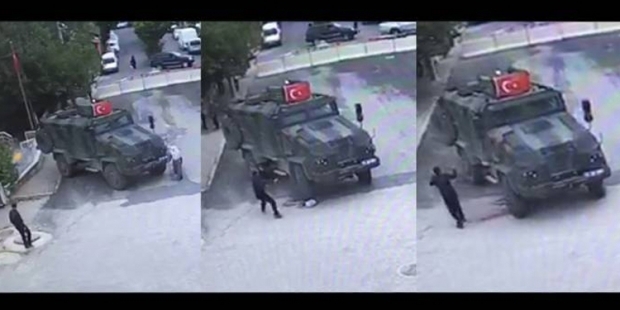 The video footage shows the military vehicle moving from a parked position while Hazar walks to the left of it. When the woman is about to cross in front of the vehicle, it starts moving. A person in the area who sees the woman approaches the vehicle at a distance of two meters and makes some gestures to warn the soldiers that there is someone near them and that they should stop. The vehicle moves despite the warning, and the woman is crushed to death. The military vehicle is seen moving on despite the tragedy it left behind. As part of an investigation launched by the Lice Chief Public Prosecutor’s Office, the driver of the military vehicle, special sergeant S.K., was briefly detained. An indictment, comprising only one paragraph, was drafted by the prosecutor’s office against S.K. seeking a jail sentence of between two and six years on charges of involuntary manslaughter. The trial of S.K. is being held at the Lice Penal Court of First Instance. In the meantime, a report drafted by the Lice Gendarmerie Command on the incident found S.K. free of fault although he was driving the vehicle in an area that was closed to traffic, while the victim was found to be at fault on the grounds that she acted carelessly. When the lawyer of the Hazar family, Serdar Yel, objected to the report and asked that it be sent to the Ankara Council of Forensic Medicine’s (ATK) traffic department, the ATK found S.K. to be at fault because he drove the vehicle on a road that was closed to traffic and Hazar was within his field of view. The killing of civilians by military vehicles is common in Turkey’s Southeast, where there is a heavy military presence due to ongoing clashes between the Turkish military and the outlawed Kurdistan Workers’ Party (PKK). In May 2017, two children were killed when an armored police vehicle rammed into their house in the Silopi district of southeastern Şırnak province while the children were asleep.